I am excited as crafts and spring ideas have been catching my eye in the past month. The days are longer. It is slowly warming up. I think it is perfect walking weather. So let me know what you think of the following!! Domino has a lovely home tour. I am always drawn in by brick inside a house. This caught my eye as the the apartment is 750 square feet and I think looks incredible. 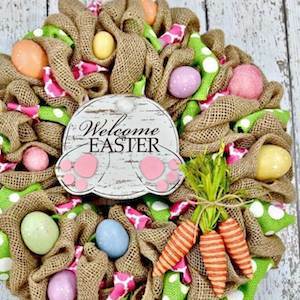 Check this out Prudent Penny Pincher takes us to the Dollar Store for some neat Easter craft ideas. The above kitchen post title was “the most beautiful kitchen on Instagram”. So seriously that caught my eye. What do you think? As someone who always has a couple of journal on the go I thought this was a neat idea to separate sections. Check it out at Recycled crafts. Head over to Buzz Feed and check out 22 ways to organize a tiny space. You can always start now! Great questions to keep in mind–thanks! Terrific post as always, and I love the color of that kitchen, as well as the classic stove!